The University of Alabama retained NLA in 2005 to study improvements to the hardscape, lighting and landscaping of the University’s historic 20 acre Quadrangle. Plans for improvements will be phased over several years to accommodate the intense public use requirements of the University’s primary open space. The Quadrangle is home to Denny Chimes and serves as the vista from the President’s Mansion and as the front door for the Gorgas Library. It is one of the most visited places on campus, especially during home football games. 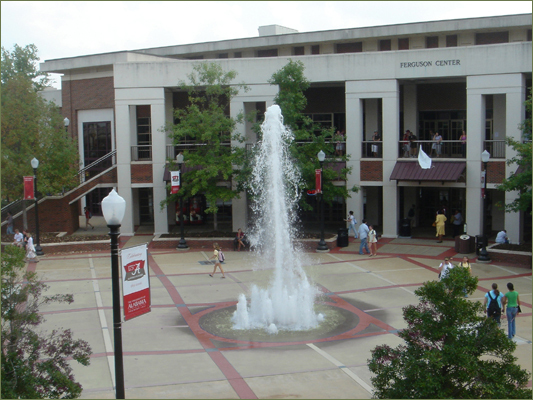 After the successful efforts at the Quadrangle, NLA was also asked to re-design the hardscape plaza at the student union, The Ferguson Center. The design includes a participatory fountain, new seating areas, appropriately scaled lighting, and plant materials to bring activity and scale to the hardscape area. NLA is currently working on the Paul W. Bryant Museum designing the entrance plaza hardscape and plantings.